Louise Bourgeois (1911–2010) was a French-American artist renowned for her intensely personal body of work that is influenced by Surrealism, Abstract Expressionism, and Minimalism. Over the course of her nearly seven-decade career, Bourgeois created an emotionally charged visual vocabulary of haunting biomorphic forms that communicate themes from her inner life and family history. Her diverse practice spanned sculptural works, painting, drawing, and printmaking. During the mid-1990s, Bourgeois began using fabrics and clothing that she had accrued over decades. These fabrics, which included napkins, handkerchiefs, and tablecloths, reference, among other things, the tapestry workshop her parents owned when she was young. She described the medium of fabric, and clothing in particular, to be “an exercise of memory.” Bourgeois transformed such materials into a series of collages, “fabric drawings,” and sculptures. While the collages and drawings display abstract, repetitive patterns, the sculptures are modeled after figures and amorphous body parts. 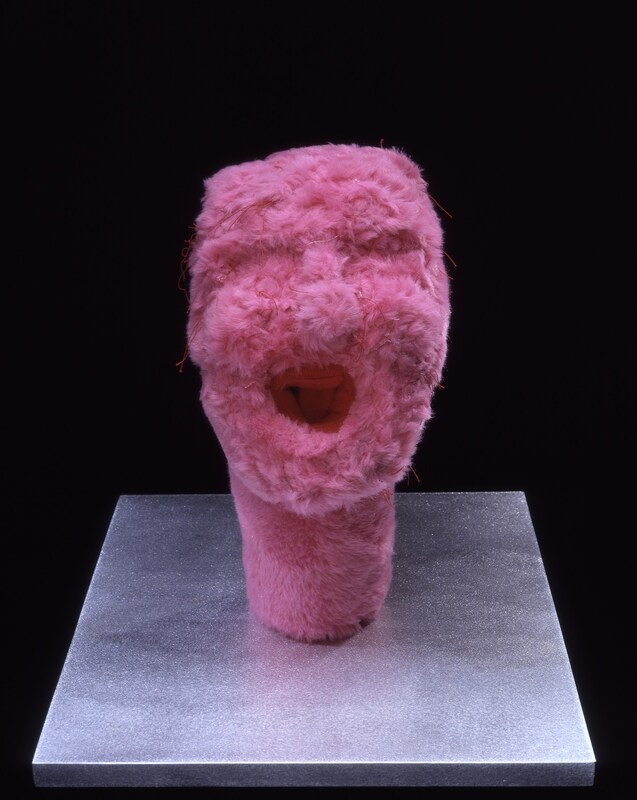 This untitled work takes the form of a head covered in roughly stitched plush pink fabric. From its center, a dark-red, wide-open mouth gapes, revealing a cavernous throat. The fur and delicate threads have the softness of a child’s toy, yet the red, lipless mouth seems repulsive in contrast. Evoking the corporeality of a body and its fetishistic associations, the sculpture invites open-ended references: from a child begging to be fed to a lewd sexual act. Bourgeois’s fabric works are emblematic of certain overarching themes in her oeuvre, such as marriage, motherhood, sexuality, femininity, and domesticity. This focus on the familial results in works of intense psychological complexity that expose power relations and hierarchies related to traditional female identity. Bourgeois’s work has been widely exhibited at many major international institutions for decades. In 1982, at the age of seventy-one, she was recognized with solo exhibitions at the Museum of Modern Art and the Metropolitan Museum of Art, New York. In 1993, Bourgeois represented the United States at the 45th Venice Biennale. In 2008, she was the subject of a major exhibition at the Centre Pompidou, Paris, and had a full career retrospective at the Solomon R. Guggenheim Museum, New York. Bourgeois’s work appears in the permanent collections of significant museums worldwide, including the British Museum, London; the Metropolitan Museum of Art, New York; Musée d’Art moderne de la Ville de Paris; Museo Nacional Centro de Arte/Reina Sofia, Madrid; the Museum of Modern Art, New York; the Solomon R. Guggenheim Museum, New York; The State Hermitage Museum, St. Petersburg; Tate Modern, London; and the Uffizi Gallery Museum, Florence.